A how-to book that guides you to makes angels, candleholders, suncatchers, mirrors, picture frames, garden ornaments and more, from easy to more complex. Includes full-size patterns for all 40 projects, plus 2 bonus patterns. Instructions illustrated with step-by-step photos. 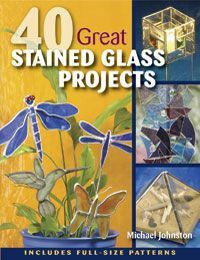 Pro-tips from experienced stained glass artist Michael Johnston, soldering, lead and foil, building 3-D projects and more. Includes: 42 full-size patterns & 1026 color photos.